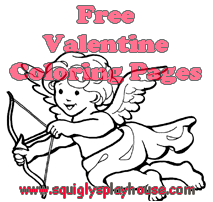 Browse our collection of over 30 Valentine's Day coloring pages for kids. Color pictures of cupid, sweet treats, hearts, happy couples and more. Coloring is a fun activity for kids and did you know it helps with your child's writing skills, hand eye-coordination, fine motor skills as well as stimulating their creativity and self expression?! So grab some paper, fire up your printer and put the crayons on the table and spend time being creative. Display your child's works of art on the fridge, on a bare wall or even frame it. Help your child take pride in their creative efforts. If you're running out of display space at home, remember grandmas and grandpas love getting mail from their grandchildren. Our free coloring pages are available to be used over and over again so print our PDFs and use them at home, on the go or in the classroom. Learning is fun at Squigly's Playhouse. To see our full range of our Valentine's Day activities for kids check out this page!